The world of illumination has shown quite brightly in recent weeks, introducing lights as thin as a razor, a traffic light app, the push for LED lighting at IKEA and advancements in horticulture just to name a few. In case you missed out on these developments, we have you covered. Stay tuned as we uncover a few of the newsworthy tidbits that have lit up our world in this edition of Lighting in the News. It’s no secret; LED technology has taken the lighting world by storm. However, OLEDs may be on the rise to steal a little of that thunder. The latest creation in OLED lighting technology is the Aerelight. Attempting to make a wave in the commercial and home lighting space, the Aerelight is a sleek razor-thin cordless table lamp. It is built with a mounting base that houses a built-in charging pad. The lamp has the capability to reach three levels of brightness by merely tapping on the frame that’s made from anodized aluminum. According to the creators of Aerelight, OTI Lumionics, this is the first home lighting fixture of its kind. How many times have you sped up trying to catch the green light, or got caught reading or texting at a red light, only to be startled to death by the sound of your fellow drivers’ horns? It may be safe to say that the unpredictability of the traffic light is officially behind us. EnLighten, is a new phone app created to help you save on gas and time by predicting when traffic lights are expected to change. The app communicates information from the Traffic Management Center (TMC), where traffic lights are controlled by states. The data taken from TMC is sent directly to Connected Signals, the creators of EnLighten, and then sent to your phone in real time. The app lets you know how many seconds the light will be red or green, and even gives a little ding when the red light is over, which is much better than a honk. Maybe intense uninterrupted dancing for 30 seconds at a red light can finally happen. Ikea is officially moving on. The global Scandinavian chain retailer that specializes in assembly made easy furniture is clearing their shelves of incandescents, compact fluorescents, and halogen lights to exclusively sell LED bulbs. The company had previously decided to focus on CFLs. 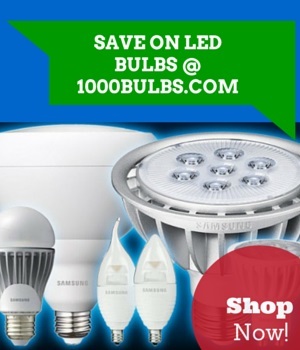 However, they moved forward in focusing on LEDs despite CFLs still outnumbering LEDs in sales. “Some of these technologies have to be driven faster,” explained Steve Howard, the chief sustainability officer of the Ikea Group. The big change will officially begin September 1. Pennsylvania State University and Illumitex have joined together in an educational partnership. Illumitex specializes in various lighting applications including manufacturing grow lights for hydroponics and greenhouses. The company is providing the university’s College of Agricultural Sciences with over 400 Illumitex Eclipse ES2 LED grow lights. The lights will be used to operate numerous greenhouses on the campus. According to greenhouse manager for the College of Agricultural Sciences, Scott DiLoreto, “The lights will significantly expand opportunities for research and learning in our greenhouse facility.” Before the switch to Illumitex grow lights, the primary source for lighting in Penn State’s greenhouses was HID lighting, along with a much smaller Illumitex LED installation. With the increase in LED grow lights, more exploration will go into the future of horticulture lighting such as advancements in growing vegetables during dark cold months. Now that’s a bright idea! The push towards LEDs globally has had a phenomenal impact on the way that we see lighting. Noted for being more energy-efficient and long-lasting, several countries have dumped their incandescent and CFLs in favor of LEDs. However, according to recent findings by astronauts aboard the International Space Station, this may be doing more harm than good. Photos taken aboard the ship snapped pictures of cities like Milan that have switched to primarily using LED lighting. The photos of illumination revealed heavy light pollution. Some of the light pollution may also be attributed to the transition towards LED street lights. Unlike high pressure sodium street lamps they’ve replaced, LEDs emit more of a bluish light, which can potentially create a more dull, washed out looking sky. Sort of makes you look at your old incandescents and CFLs in a whole new light. Hopefully you feel a little more enlightened in the world of lighting. Be sure to come back soon and catch up on more illuminating news and other helpful and informative posts about lighting. If you have any questions or comments, feel free to leave them below and as always you can drop us a line on Facebook, Twitter, Google Plus, or Instagram!